Denver, CO — Police said they would be sweeping a community known to its residents as “tent city,” tomorrow, Thursday January 26, 2017. Located along Denargo between Delgany and Arkins, the group of about 50 people will likely be swept from their home tents between 9am and 11am through none of this is known for sure. People have been camping in this area on and off for years, but after the big sweep by Lawrence and Broadway on November 28th 2016, people moved up there again. This wack-a-mole sweeping of communities from the Lawerance and Broadway area to the Arkins area and back to Lawerance… has happened twice over the past year. The last major sweep of the Arkins camp occured July 13, 2016. This time, it is uncertain where there is to move along to. About two weeks ago the city went to this camp and posted a sign stating the right-of-way on which the campers live was “closed.” This is a go around move by the city to avoid using the camping ban ordinance to kick people out or take their belongings. Since Mayor Hancock directed police not to take survival gear from homeless people under the camping ban (at least until April) the city is attempting to go around that directive by going to the extreme of “closing” areas they want to kick homeless people out of. Regardless of what ordinance they are using, people are facing being moved from one of the few spaces left for groups to gather and stay safe. They risk losing their community, their home space, having all their gear to protect them from the winter weather taken by the city, and quite possibly, some could lose their lives. This sweep is taking place even while the city is facing a law suit against them for the unconstitutionality of these very sweeps. This community has no where to go. This is just one of the many sweeps which have displaced people across Denver over the past month. Communities are being swept farther and farther down the river, farther from the things they need to survive such as access to services, medical care, food and water sources, and their workplaces. At the same time as people are being swept on the river, police are telling people whom they are sweeping from downtown to go to the river. 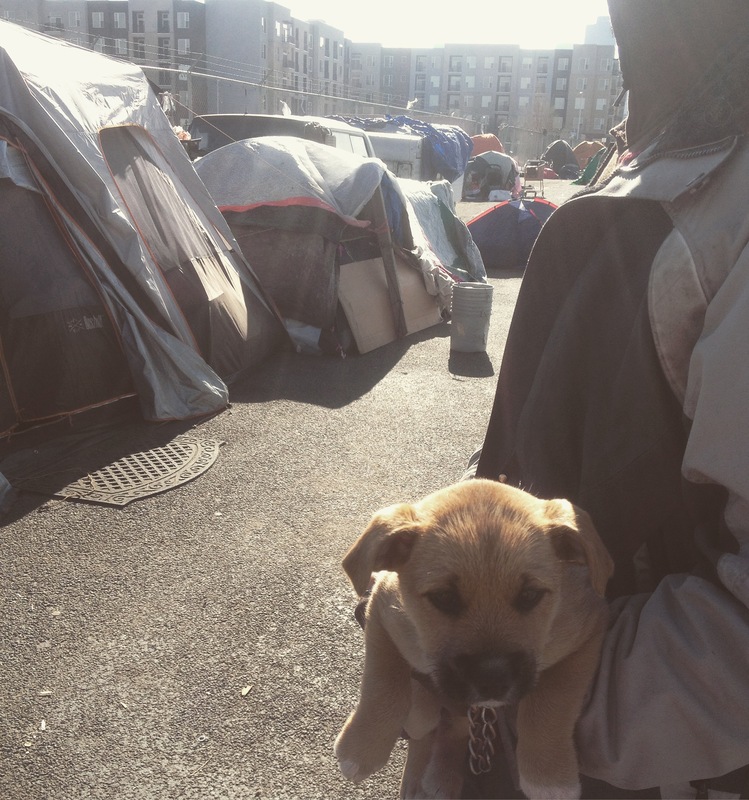 These actions by the city do very little to solve homelessness. Rather, the criminalization and enforcement only entrench the issue and further traumatize those surviving on the streets. Despite being swept again and again, the homeless community of Denver will continue to exist. Mayor Hancock, once more, you can’t sweep away homelessness. 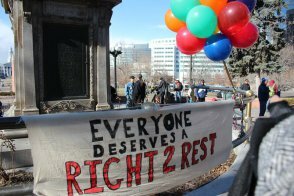 Who: Denver Homeless Out Loud, Fort Collins Homeless Coalition, Boulder Rights Watch, and all who show up to support the Right to Rest! The last two years hundreds of people have gathered on the Capitol steps for the “Right to Rest Fest” to stand together before the legislative hearings of the Right to Rest Act that year. The Right to Rest Act is back stronger than ever! in 2017, Representatives Salazar and Melton are again sponsoring the bill. 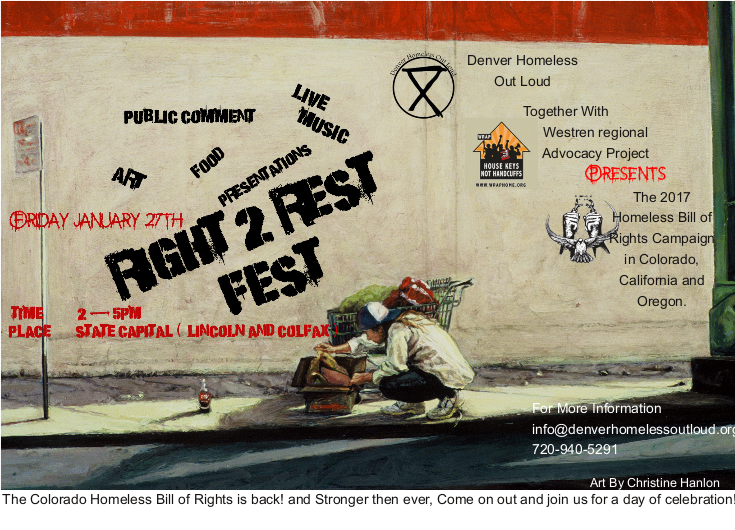 On Friday January 27th from 2pm-5pm we will be back at the State Capitol for the Right to Rest Fest! Join us to speak out, eat food, listen to music, and call for the end of the criminalization of people living without homes! In the spirit of Dr. Martin Luther King Jr. and the week commemorating his contributions to the Civil Rights movement, members of the Western Regional Advocacy Project (WRAP) are holding days of action in California, Oregon, and Colorado in support of the civil and human rights of homeless people. WRAP’s days of action will highlight and push for the passage of our Right to Rest Act, which would help end the criminalization and incarceration of homeless individuals and families. The proposed state legislation is a response to the growing trend of cities creating laws that make it illegal to sit, sleep, stand, and share food in public space. Right now in Colorado, Fort Collins city council is again considering passing a law to make it illegal to sit on anything other than “designated seating areas.” This year Colorado Springs passed a similar law banning sitting. Longmont city council is considering a camping ban, much like those in other Colorado cities, which makes covering yourself with anything other than clothing illegal. In Denver 2016 has seen a 500% increase in enforcement of the camping ban with communities being swept around the city with nowhere to go. Even in the midst of all this intense daily struggle to exist with constant police harassment under the command of city governments, homeless people have been standing up for their rights and demanding to this injustice end. The city of Denver faces a lawsuit in Federal court against it for seizing people’s property in violation of the 4th and 14th amendment of the US constitution. Over the past couple of years we have documented 1,527 homeless people’s interactions with local police, private security guards, and the criminal justice system in 17 cities in 8 states. All respondents participated in the surveys for the opportunity to speak “unfiltered” to the broader community about what is really happening on our nation’s streets to poor, disabled, and homeless community members. More than three-quarters of survey respondents (81%) reported being harassed, cited or arrested by police officers for sleeping outside, 76% reported the same for sitting or lying down and 74% for loitering or simply “hanging out.” These were far and away the top crimes for which homeless people were charged. A sad corresponding fact is that only one quarter of respondents (25%) believed that they knew of safe, legal places to sleep. WRAP continues its fight to protect these civil rights for all. Representatives in both the Colorado and Oregon state legislature are introducing Right to Rest legislation in 2017. WRAP’s Right to Rest Days of Action are taking place in San Francisco, Denver, Portland, Los Angeles, Sacramento and several other cities. WRAP’s actions stand in solidarity with the Black Lives Matter movement and all other groups fighting unjust, violent law enforcement.